Are you researching solar power systems in Sacramento? Want to invest in one and reap the benefits of renewable energy? West Coast Solar is here to help. 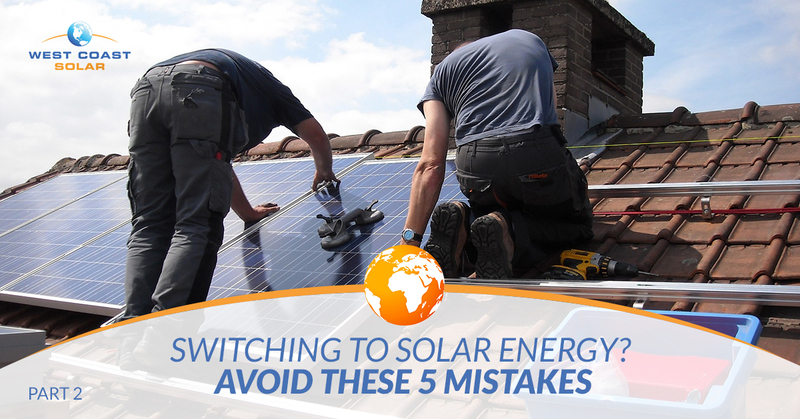 In part I of this blog series, we discussed the first two of five top mistakes homeowners make when purchasing their solar system. In the following post, we’ll discuss the final three mistakes. At the end of the day, you want the best solar energy system for your home. This involves initial cost, return on investment, and overall impact on the environment. West Coast Solar is here to share with you that solar power is a great way to save money and positively influence your community towards renewable energy. To further make the point, a reputable solar installation company will be aware of federal and state level incentives so you can save the most money on your system. Whether you take advantage of the federal tax credit, a local incentive, or even a company offered incentive, you need to know what you’re able to claim. The goal here is to make sure you pay a fair, if not below market, price for your solar energy system. You will be the one paying for the setup. You should benefit from the potential incentives. During your initial research, you want to find as many ways to save money on your system as possible. Even though we’ve mentioned a handful already, and we’ve got a few more, you may be able to find something your solar installer didn’t know about or didn’t take the time to find. Take your time and search federal, state, and municipal solar incentives to ensure you’re getting the best deal for your solar system. It may seem redundant to mention this, but we’ve come across this with potential clients. They tend to take the solar installers word for what it is because the world of solar and renewable energy can be overwhelming. What do you purchase? Why do federal tax credits matter? How do I lower my initial cost? There is an abundance of information at the national and state level to answer all three of these questions. One of the worst mistakes is to not get more than one quote. When you get multiple quotes, you can compare and contrast installation, service, and cost. You will also be able to negotiate your total cost down by adding competitors into the mix. West Coast Solar will provide the best home solar power system to you at the best price. Bring in your quotes to us and we’ll work with you to get your solar system design and installation started. As we near 2021, the Solar Investment Tax Credit becomes more valuable to those looking to install a solar energy system at their home or business. The entire process of researching, getting financing, and installing your system is not one to take lightly. Depending on your financial situation, your research, and which solar companies you’ve already talked too, you could slow you up to miss the 30% tax credit. We understand switching to solar power is a big decision. The investment is substantial; however, the benefits outweigh the cost quite a bit. Nonetheless, the longer you wait, the less likely you are going to be able to take advantage of the tax credit, which could be the difference between getting your system or stuck using traditional energy methods. As electricity prices rise, solar power systems are looking more attractive. Renewable energy sources are stabilizing market pricing, which means the volatility of fossil fuels doesn’t have to be your life story. You can change it by going solar. Give us a call if you’re ready to discuss designing your home solar system. Our entire team is dedicated to delivering high-quality solar products with the best customer service in the industry. As we grow with the renewable energy industry and our client base, we want to impact the world in a positive way, helping you and others like you tap into the wonderful energy resource that is the sun.